Eurobonds are not a perfect substitute, but they may be someone’s only alternative. In some ways, Reflation #3’s weakness can be found originating in this context. The “rising dollar”, or eurodollar squeeze, of 2014-16 was a failure and even run on credit-based dollar funding offshore. If banks won’t deliver dollars, what’s left? Bonds. There has been an offshore Eurobond market since there have been eurodollars to fund it. These two are not equivalent. Banks in the latter can conjure new “dollars” in the form of any bank liability they may dream up another bank will accept. This flexibility means complexity, and in the end fragility. Eurobonds are savings, a portfolio allocation like stocks. Because it happens among offshore dollar holders doesn’t functionally shift the definitions like it does for eurodollars. In 2016, in places like Argentina completely shut off from eurodollars the Eurobond market was a lifeline. It doesn’t matter where they get them, they have to have them. The whole world still needs dollars but increasingly there is nowhere to find them (on reasonable terms). Eurobonds are not eurodollars, as I wrote last October. The Chinese were flirting with this market right at the top of this recent trend. They may have been too late to the party for their own purposes, distracted by the allure of Hong Kong while everyone else was issuing as many Eurobonds as they could. Bank-derived dollars are almost always the shortest-term, meaning largely overnight, if occasionally termed out a week or maybe a month. There is a huge interest rate differential between obtaining bank-funded eurodollars and longer-term Eurobonds. So while you can get dollars via this workaround, you have to pay up for the privilege. 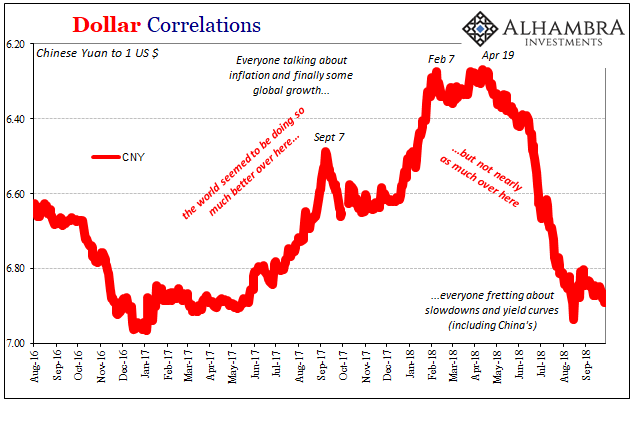 The Chinese government in issuing its dollar bond in the coming weeks is trying to reduce the cost that Chinese corporates (largely financials) might have to pay if they increasingly go this route. Bond markets, like other markets, work on benchmarks. The cheaper the government can get on its coupons, the cheaper it will be for China’s corporate sector that follows along after it (in theory). That is, unless the whole Eurobond market starts to follow the eurodollar market’s dysfunctional take on the global situation. That is what’s been different about 2018, the Eurobond’s second thoughts. As the IMF wrote in July, very different from January, growth isn’t so synchronized anymore. CNY DOWN sure does still equal BAD. Predictably, the name Lehman Brothers has been mentioned. Though that’s stretching it, the similarities are obvious. 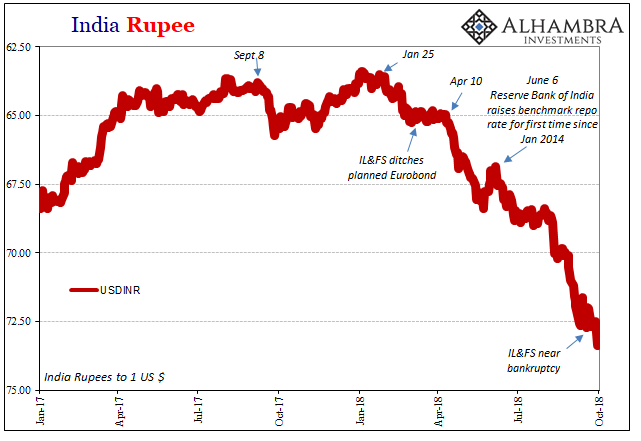 “After achieving an order book in excess of the benchmark size, the company decided to postpone the proposed dollar-benchmarked, five-year fixed-rate senior unsecured Reg-S bond due to unfavorable market conditions and its inability to achieve the desired pricing,” said an IL&FS spokesperson. And it’s going to get worse. 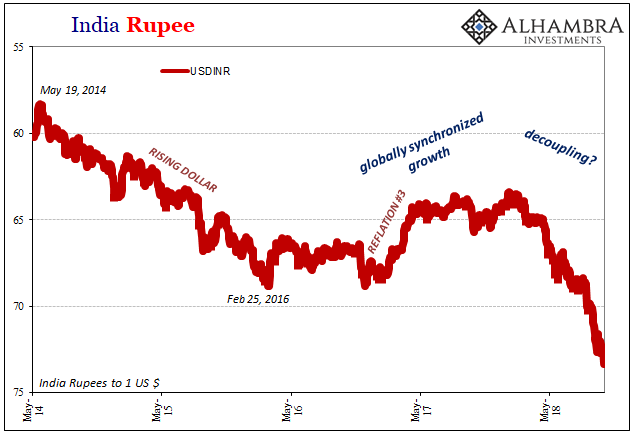 The Modi government is reportedly pressuring the Reserve Bank of India as well as India’s publicly funded Life Insurance Corporation, now the largest shareholder in IL&FS, to bail out the firm lest India experience its own “Lehman Moment.” Opposition is becoming fiercely entrenched, which won’t help confidence in either the eurodollar or Eurobond markets. There are no good options here. According to a spokesman for India’s Congress, Manish Tewari, Indians are wondering why their government appears to be working so hard “to help save foreign investors’ money with the help of India.” The appropriate analogy may not be Lehman but AIG. 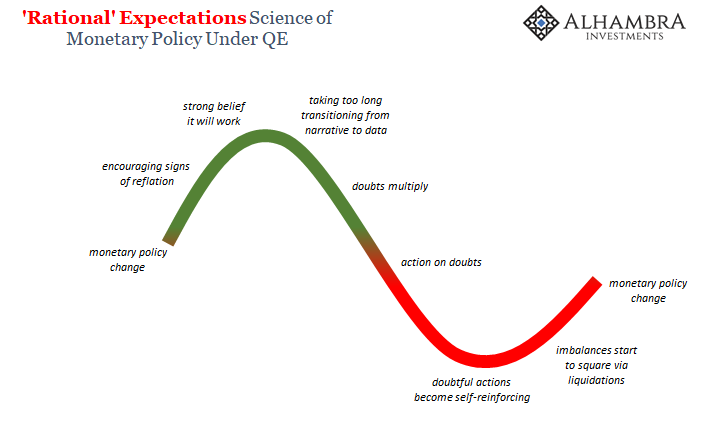 As with all things in modern monetary finance, there is much more to it. For now, it’s another warning about how things are getting serious, and just getting started. As I wrote earlier today, since August 9, 2007, the dollar will eventually come for everyone. Eurobonds as well as eurodollars. If only globally synchronized growth and worldwide recovery had been a real thing.